We’ve taken this popular blade bait to an entirely NEW LEVEL by adding premium-quality VMC® split-shank treble hooks, 3D prism eyes & chip-proof paint in HOT fish-catching paint schemes… and five of the available color patterns GLOW! Fish them vertically on open water or through the ice for walleyes, saugers, white bass, and smallmouths. A slow lift and drop, just enough to cause the bait to vibrate on the upward stroke, triggers aggressive strikes. Cast B3 Blades to river eddies and fish them back on a slow, pumping retrieve… these B3 Blade Baits are incredibly fish producers! 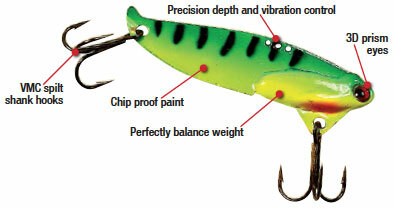 Not sure when to fish the B3 Blade Bait? Although they’ll catch fish all season long, they can’t be beat in early spring and late fall … Just ask the guys who line up at boat launches with show shovels in February, March and April. Same goes for fall. It’s counter-intuitive for sure, but what blade baits do is TRIGGER reaction strikes through visual, vibratory and auditory cues. They flash, rip, slice, slash, dart and give off loads of vibrations that are simply too much for fish to ignore! Here’s another tip: When it comes to lake trout, everything old is new again … Like fishing blades through in open water and through the ice for monster Canadian and Great Lakes lakers. During the late ‘70s and ‘80s, every lake trout nut loved his bladebaits … And although many anglers have switched to soft plastic tubes, the forgotten blade bait is an all-star! Drop to the bottom and start pumping straight up. And when you see a laker on your electronics start to give chase … DO NOT STOP reeling! If anything, reel faster and don’t be surprised if the trout hammers the B3 inches from the hole! One of the few fish without an air bladder, lake trout can scream from 100 feet down to the surface with zero equalization problems! No fizzing required! And more fun than you can shake an ice fishing stick at! Nice hooks, paint and a good glow in the dark. Superb vibration and action. Great colors that last. An excellent walleye search tool. They are good baits and have caught fish. The red tiger had the paint chip off after only a couple uses but the gold blade bait has worked perfectly. I enjoy using the blade baits but if the paint didn't chip so easily I would of rated them a 5. Great bait for early ice walleyes. The red tiger and pink and white colors are my favorites ! Would highly recommend and will buy as long as I can ! Pick one up ! We use these in the mighty Mississippi and crush the walleyes and sauger. works great, and it catches fish. I've used these blades for several years. The quality is consistent, paint and hooks hold up well and the action attracts walleye. Shipping is fast.